A flying squirrel (Glaucomys volans) should be renamed a gliding squirrel since its “flight” is more of a descending float than an ascending soar. Rather than wings, the small mammal employs a stretchy membrane that is attached from its back feet to its front feet and parachutes downward to escape from predators. Baby flying squirrels develop fur and open their eyes when they are about a month old. These youngsters begin to glide when they are roughly t wo months old. 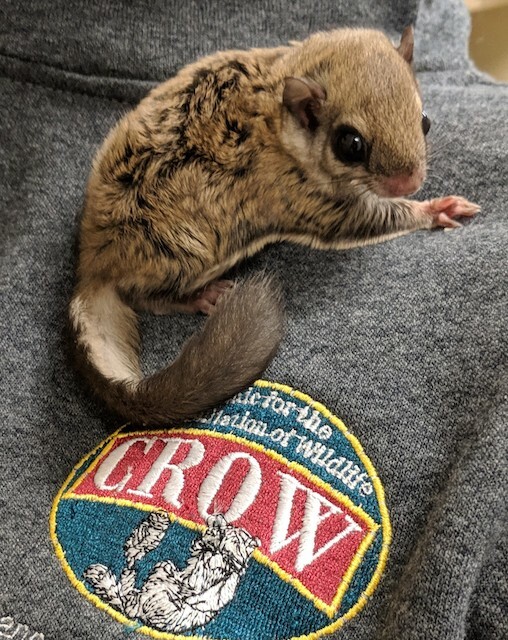 On January 8, a young Southern flying squirrel was admitted to CROW. There was no information provided about the squirrel’s home area. The juvenile’s right eye was crusted with debris. It also suffered from mild dehydration when it arrived. CROW rehabilitation staff will care for the squirrel until it is old enough for release since no information was provided about where its parents may be located. Breanna Frankel, CROW rehabilitation manager, believes the patient is between 6 to 7 weeks old based on its developmental characteristics. 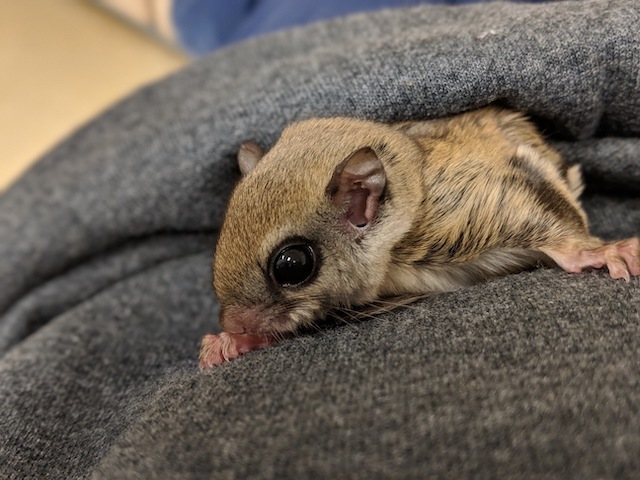 The young flying squirrel will be monitored daily until it is evaluated for release. “While at CROW, the squirrel has received several days of subcutaneous fluids to keep it well hydrated following admission to the hospital. We weaned him on to our Fox Valley formula so it had a milk supplement while beginning to eat on its own. It has been weighed every day, sometimes twice a day, to monitor weight and progress appropriately. It started getting environmental enrichment to introduce him to branches, trees, leaves and natural food sources,” said Frankel. “Most recently, it was weaned off the milk formula because it has started eating well enough that it no longer needs supplemental feeds. When the weather warms up a little, it will be placed in an outside enclosure to allow it to adjust to environmental factors in preparation for release. Even after release, it will be observed for a period of time."